LastPass simplifies your digital life. 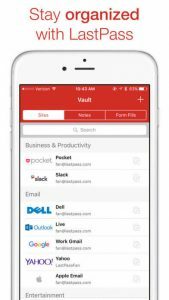 From your Last Pass Vault, you can store passwords and logins, create online shopping profiles, generate strong passwords, track personal information in photo and audio notes, and more. All you have to do is remember your Last Pass master password, and Last Pass autofills web browser and app logins for you. Get started today for free and join the millions managing passwords with Last Pass — you’ll wonder how you lived without it! Download Last Pass now and get started, completely free. You can use Last Pass across all your devices, including phones, tablets, and personal computers, for free. Business owners can download Last Pass to secure their business and share passwords safely among employees. With Last Pass, your passwords are safely stored and accessible across all your devices. Use Last Pass for password protection, document storage, or workplace security. Our Vault can handle it all. I don’t know how I lived without this. All my passwords in one place. Secure notes. Form fills.